Jay thank you for posting the photo. It is a nice 1912 early slab side as it has the outside rear door handles and the removable foredoors. Nice photo with lots of details for those with a 1912 slab side USA car. Zooming in you can see the pin-striping on the body. I think the rear wheel is at an angle because they staged the photo. I.e. they backed it up and the right rear wheel is out of the road rut and up on the higher area and the left wheel is probably still down in the other rut. Note the car is not parallel with the road/ruts but at an angle. I think it looks like 1913 on the license tag – although it may be some other year. 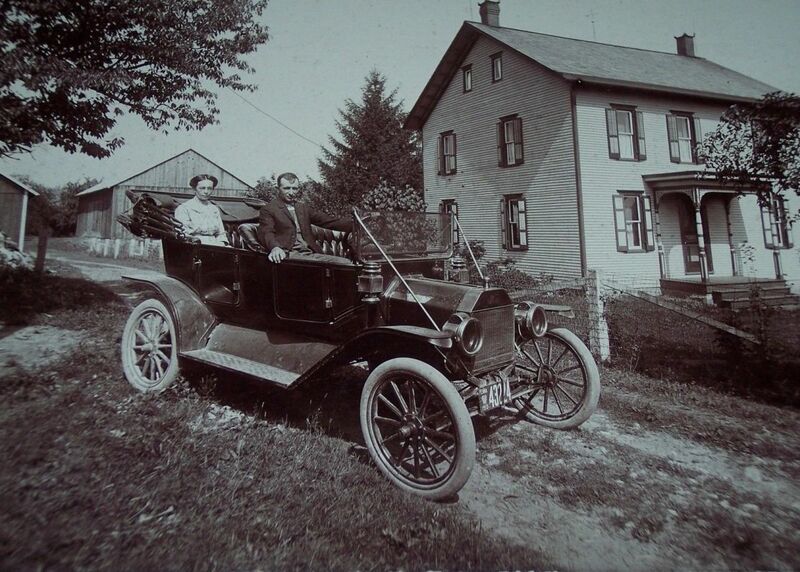 If it is a 1913 Pennsylvania license tag, then the car is probably around a year plus or minus 9 months or so old. My guess (no evidence to support this guess) the car is only a few months old and they are visiting one of their parents and this is the photo saying, "See parents we are doing ok." At least we have several of those types of photos but not that early, in our family photo albums. Again, thank you for posting it. Interesting, that the black paint on the crank handle is gone already, or perhaps they failed to paint it? The crank handle looks like wood. Did they paint a wooden handle? If it is wood then when did Ford change to a metal handle? Or is the handle on my '22 Coupe wrong? The very first early few 'T' cars has wooden handle cranks, then they went to a rubber type material then they went to aluminum, then to steel. Note the comment from Feb 1911 that the aluminum crank would be polished and not painted black. That would fit that photo. Also the MTFCI Judging guidelines for 1912 mentions starting crank "Aluminum ... painted black on some production." A wooden handle has been seen on a seemingly original two-lever '09, but this may have been a replacement part. Ford blueprints indicate the handle as being hard rubber, the same part as was used in the N-R-S models. The forged starting ratchet was riveted in place. Handle was hard rubber, secured with a long bolt. The starting ratchet was still riveted in place but was now made of pressed steel. Handle changed to aluminum late in the production year. Painted black enamel, including handle. Aluminum handle the same as the later 1911 type (All black, including handle.) In February 1911, however, a letter read, “Removed ridges from outside of handle and added dimensions specifying the exact shape of same. Called for polish all over.” The ratchet was redesigned in late 1913 and now had a different configuration of the notches which engaged the starting pin on the crankshaft. Handle changed to an iron sleeve, held with a rivet-like bolt. Later versions have been seen which used a riveted-in-place pin instead of the bolt. About 1919 the starting ratchet pin was changed to a rivet with a hole for a cotter pin. The pin was no longer riveted in place. The ratchet was changed from pressed steel to malleable iron. In 1915 the factory number and foundry trademark were added inside the ratchet. In 1918 the “Ford” was added, and in 1919 the “Ford” in script was sunk into the casting. Handle a thin steel sleeve rolled into place on a formed crank.